An image of a small doorway on La Trobe Street to the former Magistrate’s Court Building in Melbourne’s CBD. The Former Magistrate’s Court Building is a three-storey building of French Romanesque design. 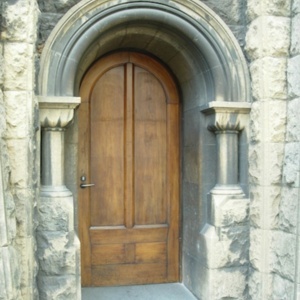 The doorway is in the neo-Romanesque, Romanesque Revival, or Norman Revival architecture style. It features a deep-set semi-circular arched door and doorway with stone decorated hood moulding. The door is flanked by two small columns with decorated capitals. The Former Magistrate’s Court building was designed by Department of Public Works architect George H B Austin and built by the Swanson Brothers. It replaced a two-storey brick building on the site that previously housed the Supreme Court and then the Court of Petty Sessions. Construction of the new building began in 1911 and was completed in 1914. The Court of Petty Sessions, later renamed the Melbourne Magistrate’s court, operated from the building from 1914 until 1995. It is now owned by the Royal Melbourne Institute of Technology (RMIT) and is used for lectures. 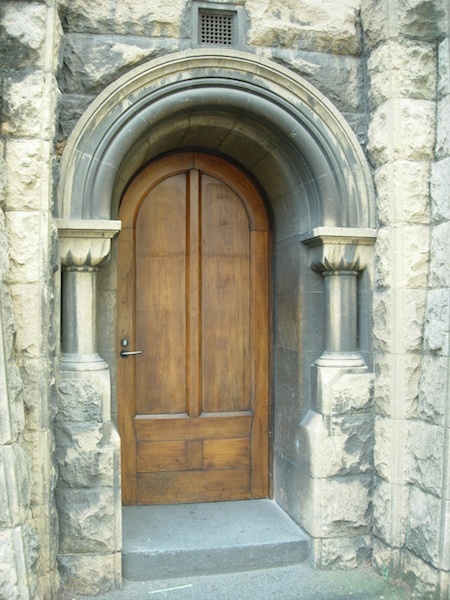 “Small Romanesque Arched Doorway, Former Magistrate’s Court, Melbourne,” Medievalism in Australian Cultural Memory, accessed April 25, 2019, http://ausmed.arts.uwa.edu.au/items/show/1303.